The Zenmuse X7 is a compact Super 35 camera with an integrated gimbal made for high-end filmmaking that delivers stunning resolution and image quality. Its compatibility with the Inspire 2 offers the best in next-level professional aerial cinematography. 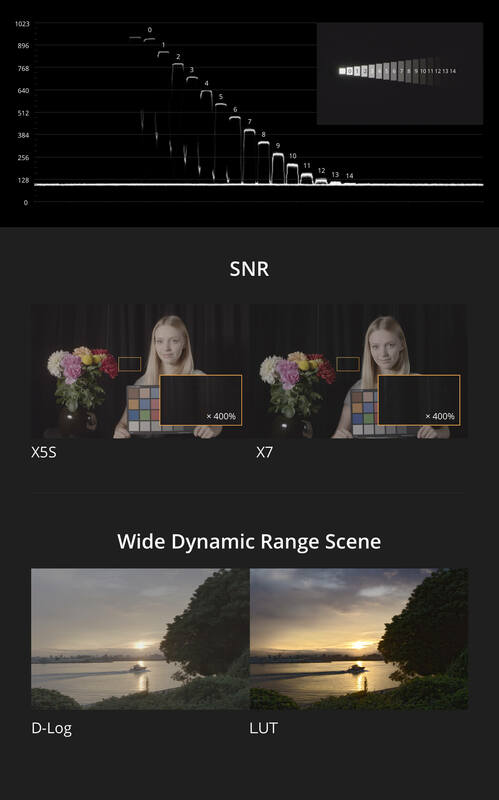 A 24 MP CMOS sensor rated at 14 stops of dynamic range preserves astonishing detail and offers both 6K CinemaDNG and 5.2K Apple ProRes with support for continuous RAW bursts shooting at 20fps and 24 MP stills. The X7 also introduces the DL-Mount, the world's first integrated aerial lens mount that allows switching between four available prime lenses quickly. 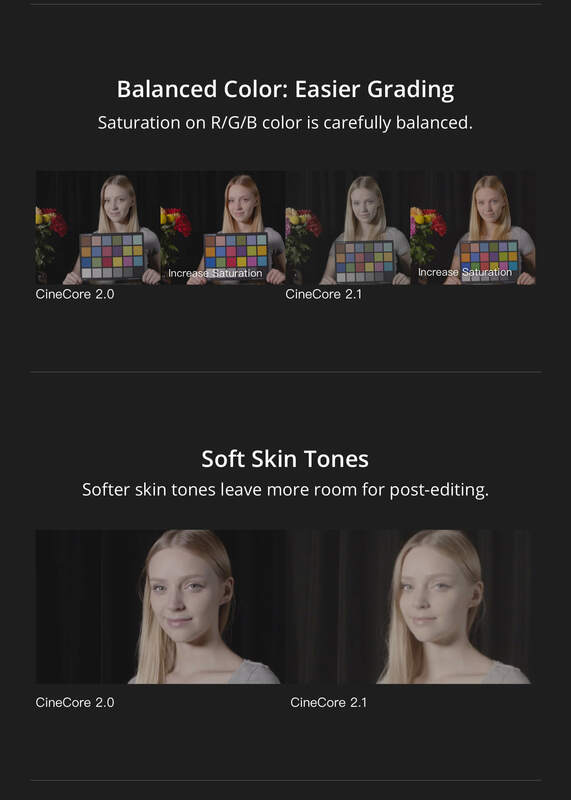 For seamless editing, a new DJI Cinema Color System preserves accurate colors for easier post-processing. These latest innovations allow filmmakers to reach new heights and capture scenes as then imagine them with the DJI Zenmuse X7. The X7 uses a Super 35 sensor, and its high readout speed supports RAW output at 6K/30 fps and 3.9K/59.94 fps. 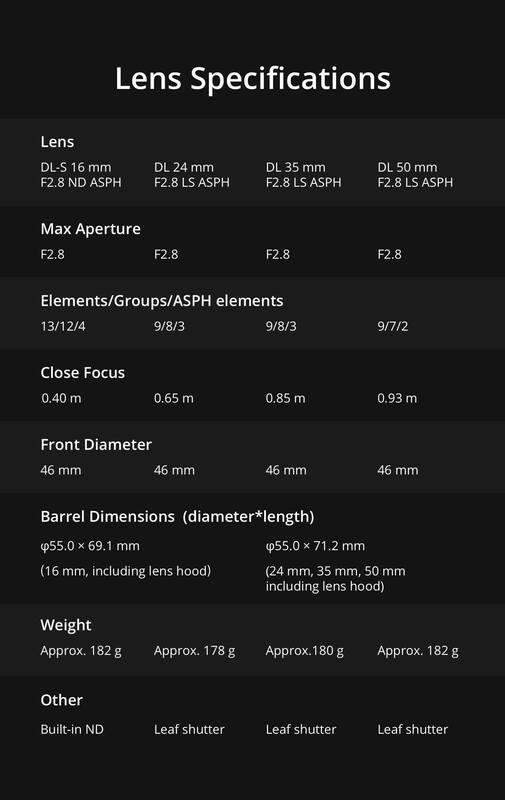 The pixel size reaches 3.91 μm and the diagonal length of the sensor is 26.6 mm when recording. 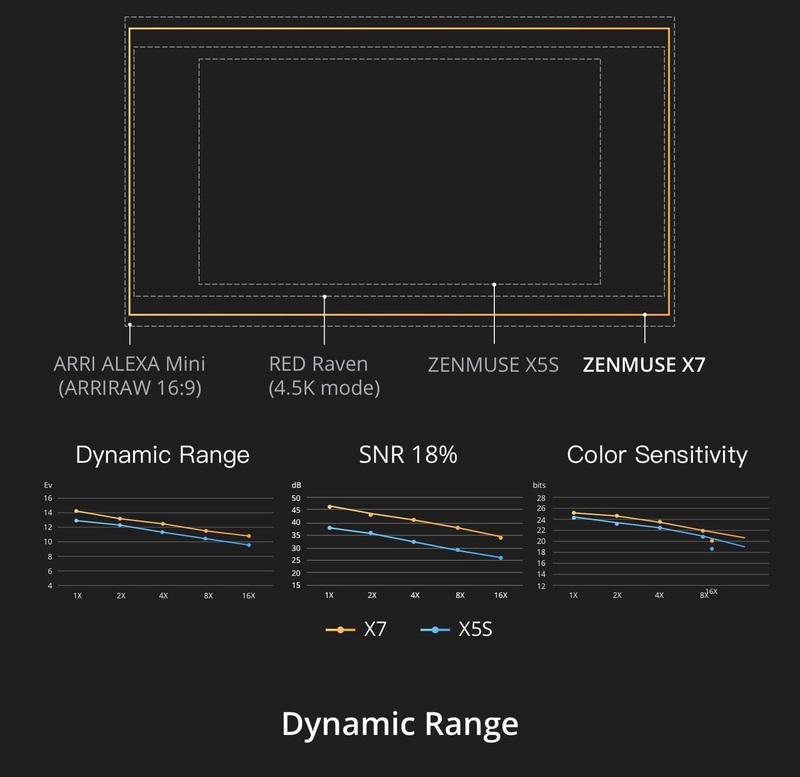 A sensor this size offers a higher sensitivity to light and 14 stops of dynamic range - much wider than the 12.8 stops featured on the Zenmuse X5S. Furthermore, the SNR of the X7 is 46 dB, 8 dB higher than the X5S, and the tonal range is as high as 9.41 bits. 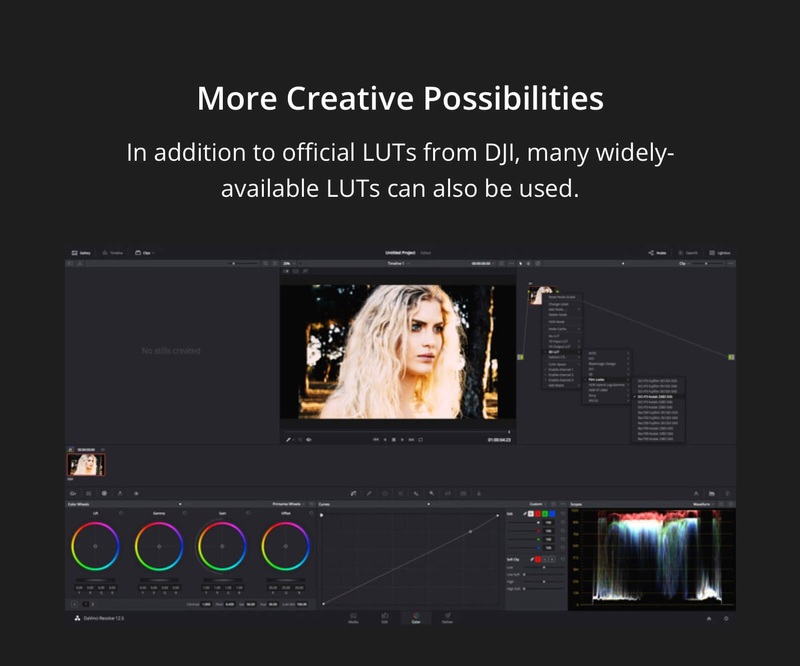 All of these features offer unlimited creative options for a better workflow in the most demanding situations on set. Taking advantage of new FSI-Cu technology, the X7's sensor features thinner interconnection, allowing light to reach the sensing area via a larger incident angle for increased photosensitivity. This enables a more compact lens mount to be used on this sensor while maintaining excellent image quality. 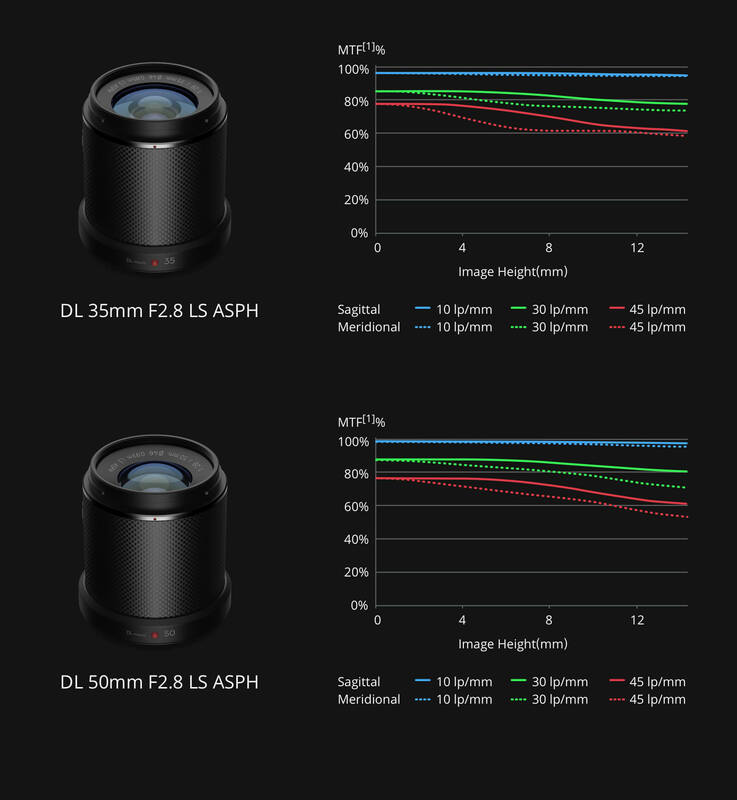 The flange focal distance of the DL-Mount is less than 17 mm - roughly 1/3 of the size of a PL-Mount. Such a compact mount means that the X7 weighs only about 630 g with a lens included. Together, the X7 and Inspire 2 weigh around just 4 kg with the ability to capture the same challenging shots as more heavy-duty setups weighing up to 40 kg. 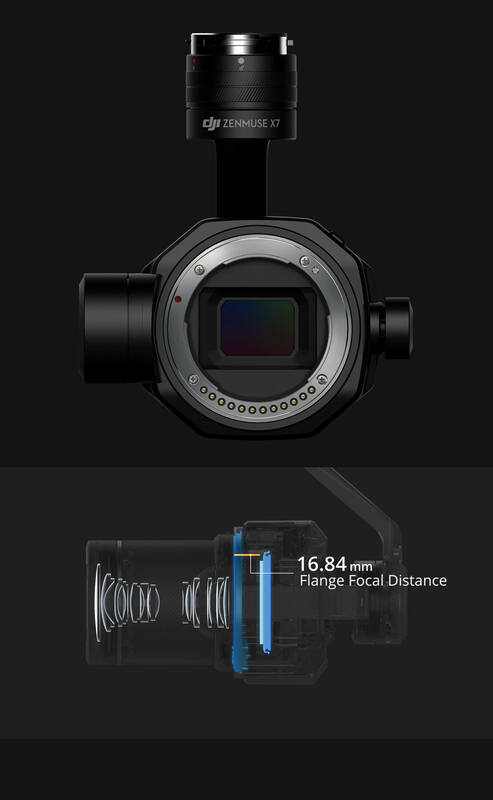 DJI offers four prime lenses for the DL-Mount system, with focal lengths reanging from 16-50 mm and resolutions of up to 8K. 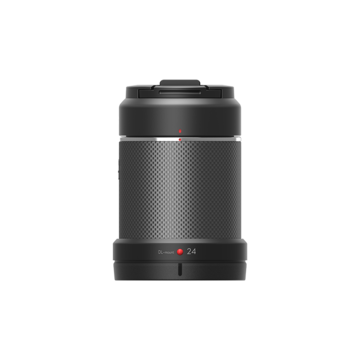 Made of lightweight carbon fiber and designed by world-leading optics teams, the four lenses have been embedded with advanced technologies crafted specifically for the X7's high-end image sensor. To unleash the X7's full potential, the CineCore image processing system on the Inspire 2 has been fully upgraded to CineCore 2.1. 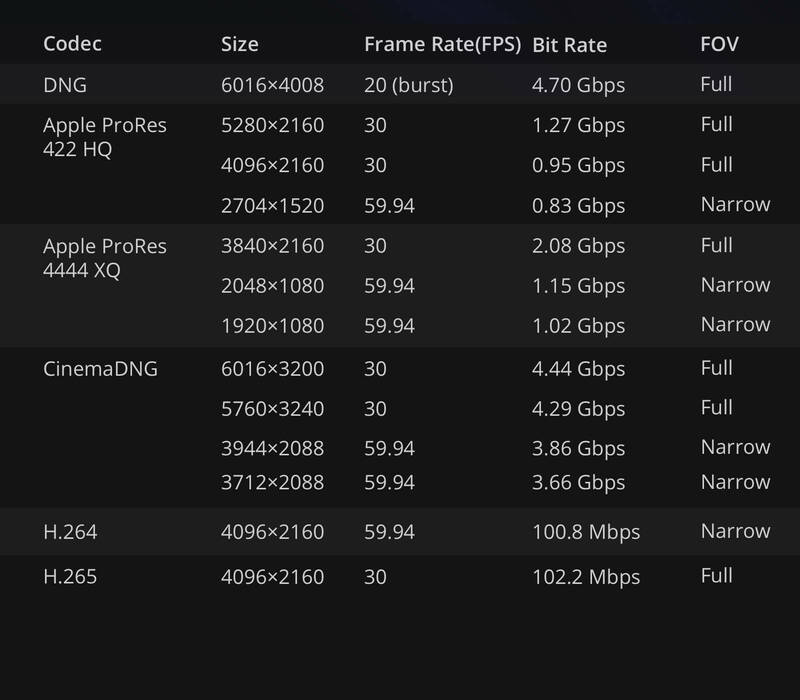 It is capable of recording 6K/30fps CinemaDNG and 5.2K/30fps Apple ProRes, leaving more creative options in post-production. A brand new EI Mode has been integrated into CineCore 2.1, which can record high-quality footage at various levels of sensitivity. 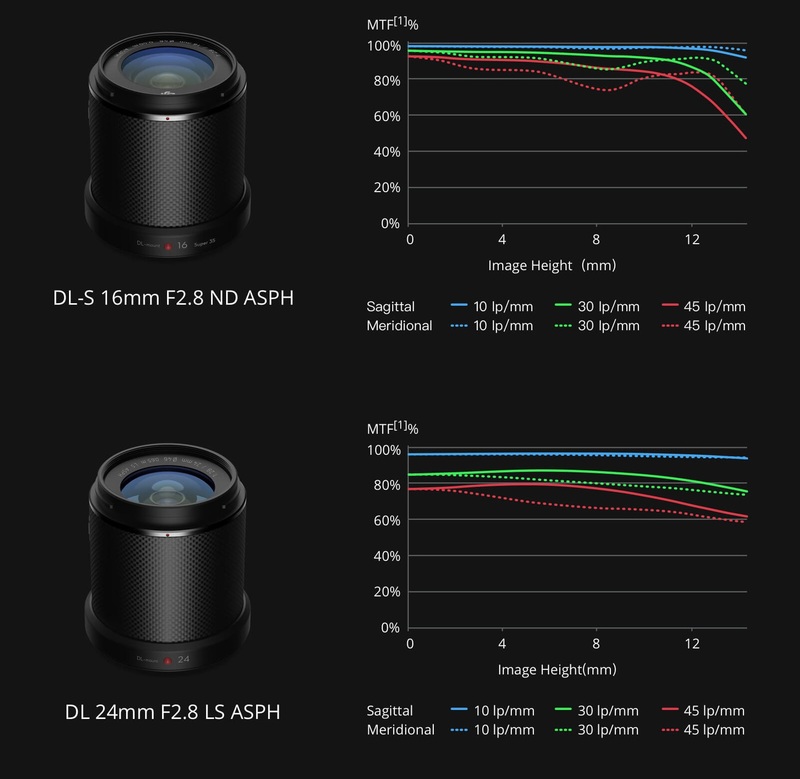 Additionally, the upgraded image processing system further reduces image artifacts and noise, preserving more details while adopting an improved dark level correction system for pro-level cinematic images. 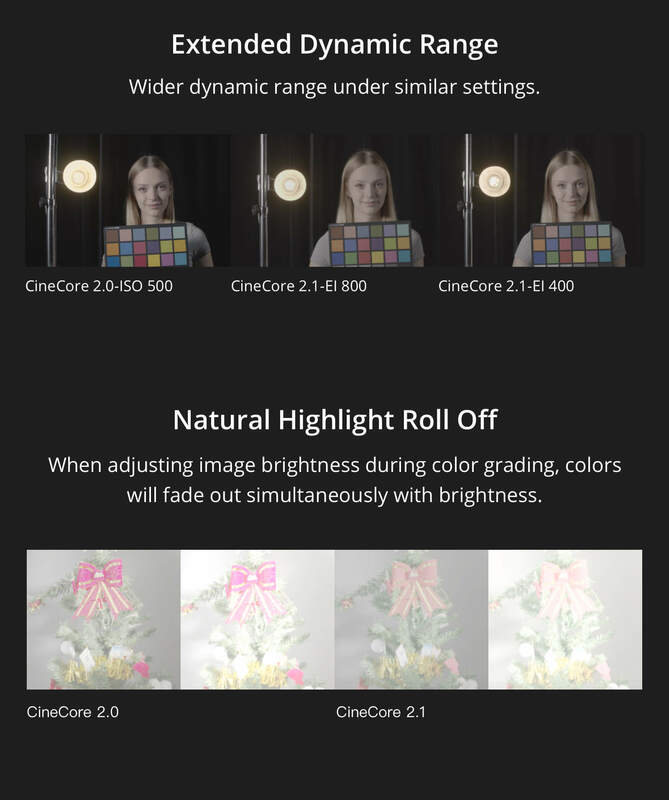 The new color system consists of a new D-Log curve and s D-Gamut RGB color space. 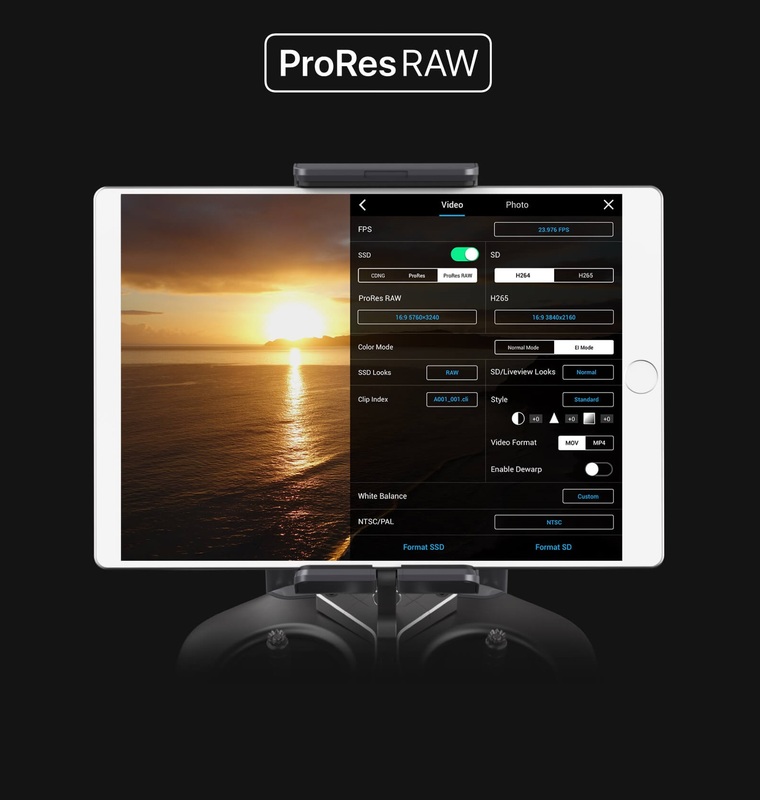 With professional cinematography in mind, the D-Log can encode 15 stops of dynamic range, two stops higher than the Zenmuse X5S, Even in poor light conditions, the X7 can still preserve stunning details in shadows and highlights, leaving more room for post-production creativity. 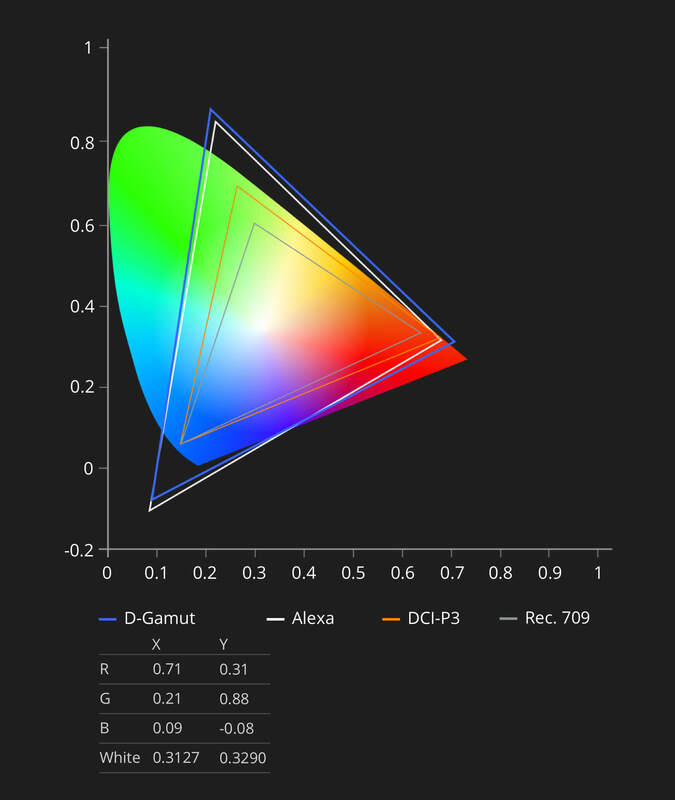 D-Gamut covers the entire DCI-P3 color space commonly used in filmmaking. Tailored for aerial cinematography and stills photographym D-Gamut provides larger green tone coverage, delivering beautiful green gradation for your shoots.